An increasing number of power amplifiers support envelope tracking technology to improve efficiency and therefore extend battery life in smartphones and tactical radios. 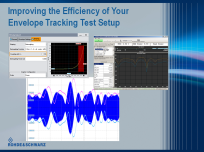 This webinar explains the basic principles of envelope tracking and the test challenges involved in this technology. As envelope tracking is often used in combination with predistortion, this topic will also be covered. The requirements for a complete test solution are discussed and demonstrated using an efficient and compact test setup consisting of an advanced vector signal generator and signal analyzer from Rohde & Schwarz.